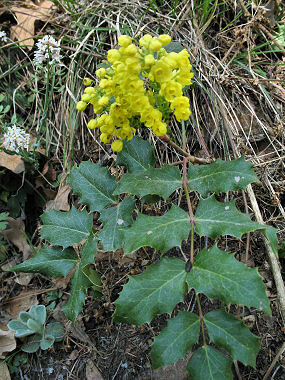 Creeping Barberry is a member of the Barbery Family. It is a low, creeping shrub that grows to 1 foot in height and has shiny, dark green holly shaped leaves that grow to 10 inches in length. The plant typically grows in open pine forests and on wooded slopes at elevations between 5000 - 10000 feet. The berries of the Creeping Barberry are used for jelly and eaten by wildlife. 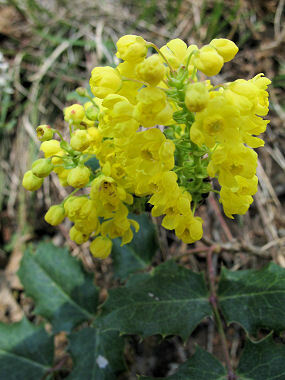 Creeping Barberry typically blooms between April - June and produces a dense cluster of fragrant, yellow flowers with 6 petals to 0.75 inches in width. Flowers are followed by flusters of bluish purple berries.